Two supporters of ousted Egyptian president shot dead as military forces disperse a rally in Beni Suef. Two supporters of ousted Egyptian president Mohammed Morsi were reportedly shot dead on Tuesday evening, as military forces attempted to disperse a pro-Morsi rally in the Egyptian city of Beni Suef, south of the capital Cairo. An eyewitness told the website of the Al-Ahram newspaper that hundreds of Morsi supporters had gathered in front of a mosque to begin a pro-Morsi march, when a passing military patrol attempted to disperse the crowd, leading to violent clashes. Medical sources told the newspaper that the two protesters who died sustained gunshot wounds and that two out of eight other injured protesters, who are all suffering from bullet wounds, are in a critical condition. A senior military official in Beni Suef told Al-Ahram that security forces had not fired at protesters. Since the army ousted Morsi at the beginning of July, there have been clashes, sometimes violent, between his supporters and his opponents, as well as between Morsi opponents and security forces. 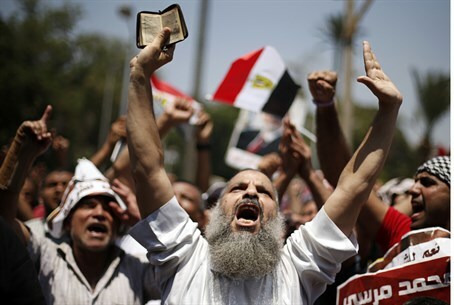 The last week, however, has seen comparatively few violent clashes between Morsi supporters and security forces. On August 14, the authorities forcibly dispersed Muslim Brotherhood sit-ins in Cairo, and hundreds were killed. Almost 900 people, including more than 100 soldiers and police officers, have been killed in clashes in Egypt since the sit-ins were dispersed. Egypt’s Interior Ministry has released a video which, it said, shows Muslim Brotherhood snipers firing onto security forces as a protester camp in Cairo was being dispersed.